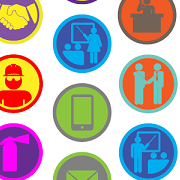 Gamification Badges for Moodle Learning Motivation! MoodleBadges Free is a library of expertly designed gamification badges for use in your own learning management software. Better than digital chocolate, these badges represent awards, skills and achievements in a fun visual fashion! Badges are designed to work with Mozilla Open Badges and work directly in Moodle LMS 2.5, Moodle 2.6, Moodle 2.7, Moodle 2.8 and Moodle 2.9, on web, tablet and iPhone. These could however, be used in any website or mobile application. Why give these away for free? We found a lack of suitable graphics were available to learning development managers and educators. Most demonstrations of badges in learning management systems such as Moodle used random clipart or unlicensed materials. Our hope is, with a free set of engaging and communicative badges, the adoption of gamification features in learning management systems will flourish! We encourage you to explore the badges and use them in your Moodle, be sure to read the license and please let us know if you do use them. We are keen to produce more badges for the community, please feel free to contribute your ideas. MoodleBadges Free is a library of expertly designed gamification badges for use in your own learning management software. Better than digital chocolate, these badges represent awards, skills and achievements in a fun visual fashion! Badges are designed to work with Mozilla Open Badges and work directly in Moodle LMS 2.5, 2.6 and 2.7 on web, tablet and iPhone. These could however, be used in any website or mobile application. We encourage you to download the badges and use them in your Moodle. Enjoy!